Using the Hierarchy of Controls helps you decide the control measures needed to manage a risk. The control measures at the top of the hierarchy are more effective than those at the bottom, as they generally provide better protection for your workers. The most effective control measure involves eliminating the hazard altogether. It can be challenging and costly to eliminate a hazard during the construction phase of a project, so the most effective way is to do it at the design or planning stage. If you have can’t eliminate a hazard, try to substitute the process or product with a safer alternative, for example replacing a hazardous product such as a chemical for one that is less toxic. Again, substitution can be difficult if it isn’t considered at the design or planning stage. 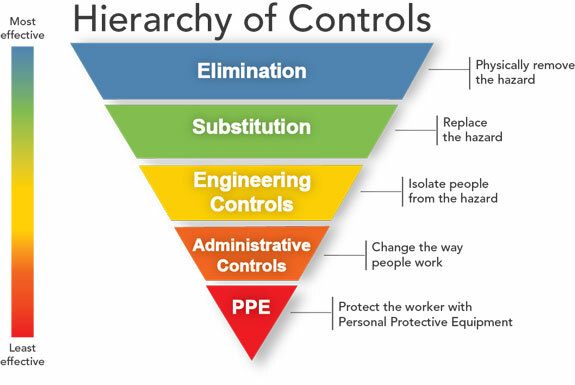 Engineering controls are considered to be safer than just relying on administrative or personal protective equipment controls, which feature at the bottom of the hierarchy. This is because engineering controls remove the hazard at its source (isolates) before it impacts the safety of workers. Examples of engineering controls used in construction include edge protection, dust extraction systems and the use of guards on machinery. As administrative control measures don’t control the hazard at the source, they’re considered a less effective option. However, when used in conjunction with other control measures they can be effective. Examples of administrative controls include a well-documented work procedure, training and the use of signage. The effectiveness of PPE relies heavily on a worker wearing the supplied PPE correctly and it fitting appropriately. For this reason, PPE should be solely relied on as a last resort or when used in combination with other more effective control measures. Examples of PPE include ear muffs, respirators, face masks, hard hats, gloves and protective eyewear.